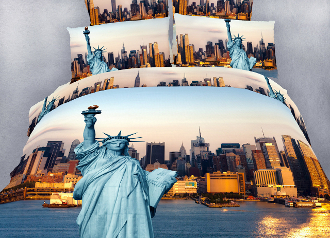 Wake up to the energy of the greatest city scenery and get inspired with the hope that radiates from the picture of Statute of Liberty. The softness of the 100% combed cotton and the distinct gift packaging also make a great choice for a gift. 46 Piece Luxury Duvet Cover Set Bed in a Box with Reversible Design. Fits Twin,Extra Long Twin, Full/Queen and Size mattress up to 16 inches tall.